When Energy Systems Group (ESG) set out to help Northern Illinois University (NIU) with an innovative way to heat two swimming pools in its Gabel and Anderson hall facilities, it turned to McCauley Mechanical to design a solution. The project, part of the seventh phase of ESG work at NIU, marked the first time that ESG had installed solar panels at an owner’s request. McCauley went right to work, surveying the roofs of Gabel and Anderson halls to make sure they could withstand the weight of a solar-panel system, then designing a structure that would support the panels. “Designing the system was no easy feat, because the structure needed to be able to withstand significant winds,” explains ESG project manager Edward Ohlson. For the Anderson Hall system, a structure was installed with 180 solar panels. The installation is used to heat the Anderson Hall Pool, with a surface area of 4,692 sq. ft.
At Gabel Hall, ninety-six solar panels are used to heat the indoor pool, which has a surface area of 2,625 sq. ft.
Ohlson says that NIU will reap the benefits of the installations in the form of energy savings for years to come. 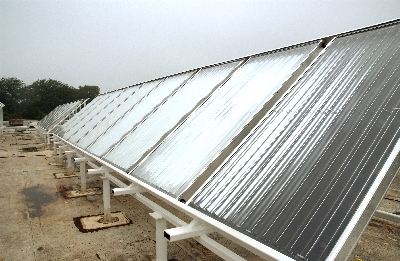 The solar heating system at Anderson Hall is anticipated to save $13,000 annually in energy costs, while the energy savings at Gabel Hall are estimated at $7,000. 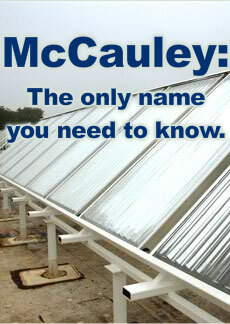 Why did ESG turn to McCauley? “Universities can be demanding when it comes to their work, and McCauley is the gold standard… they are very reliable,” says Ohlson. “There are a lot of good contractors out there, but what separates them are the ones that hit the gray areas – the ones who attend all of the construction meetings and provide accurate status assessments – and that’s where McCauley excels,” added Ohlson.